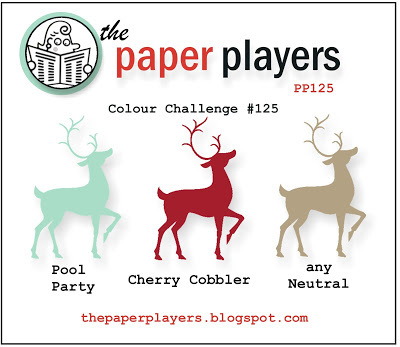 H2 Designs: The Paper Players Challenge #125 - Colours from Nance! 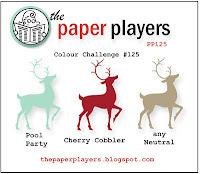 The Paper Players Challenge #125 - Colours from Nance! I've used a mix of old & new here, stamping the leaf image from Summer Silhouettes over the En Francais background. To give some interest to the background panel, I stamped the blossoms in Versamark & then embossed them with Cherry Cobbler EP, adding a small pearl centre to each. The retired sentiment (sans the swirls at the top) fitted perfectly into the framelit, which is raised on dimensionals above the ribbon & also finished off with pearls.